NumPy Arange Tutorial With Example | Python NumPy Functions is today’s topic. 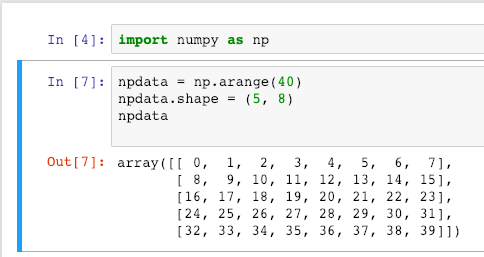 The numpy.arange function returns a ndarray object containing evenly spaced values within the given range. It returns an evenly spaced values within a given interval. For integer arguments, the method is equivalent to a Python built-in range function but returns the ndarray rather than a list. The syntax of numpy.arange function is following. start: number, optional. Start of an interval. The interval includes this value. The default start value is 0.
stop: number. End of the interval. The interval does not include stop value, except in some cases where a step is not an integer and floating point round-off affects the length of out. dtype: The type of an output array. If the dtype is not given, infer the data type from the other input arguments. Let’s see the Python NumPy arange function example in Jupyter Notebook. Write the following code inside the first cell. Run that cell using Ctrl + Enter and then write the following code in the next cell. It has created numpy array from 0 to 2 elements with a length of 3. Let’s see another example. Write the following Python code in the cell. In the above code, we have defined an array with the items of 40, and then we have numpy array’s shape attribute to shape that array into 5 rows and 8 columns. See the output. Let’s define the start and stop parameters in numpy arange function see the output. In the above code, we have passed the first parameter as a starting point then go to 21 and with step 3. See the output below. Finally, NumPy Arange Tutorial With Example | Python NumPy Functions is over.